Description: A drawing of the Olympic Cross of Merit, Second Class. 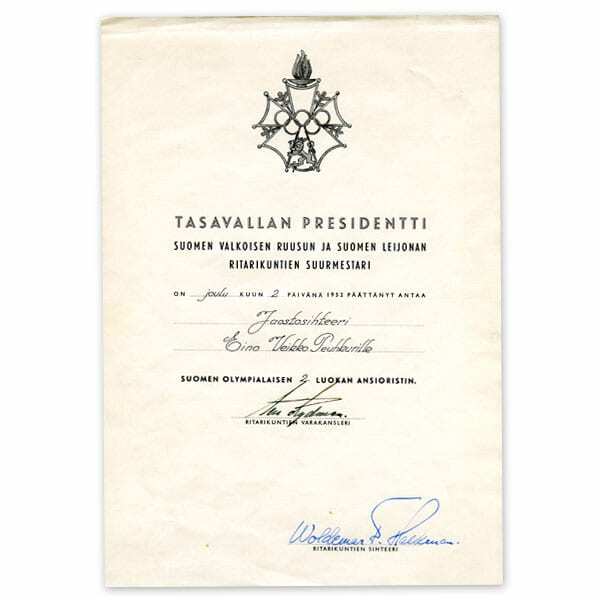 Text beginning: TASAVALLAN PRESIDENTTI SUOMEN VALKOISEN RUUSUN JA SUOMEN LEIJONAN RITARIKUNTIEN SUURMESTARI. Other information: The Finnish Olympic Cross of Merit and Medal of Merit were instituted by the President of the Republic on 21 July 1951. They were awarded for distinguished service for the Helsinki Olympic Games.